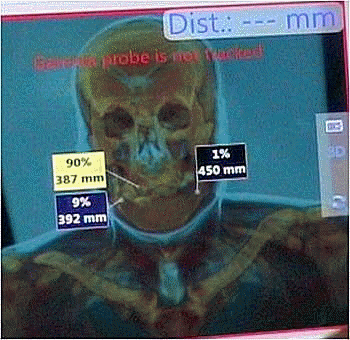 SNB is an accurate and useful diagnostic technique, but it's use in head and neck surgery is only now being introduced to the UK by Prof McGurk. It is a very accurate way of establishing when otherwise invisible microscopic clumps of cancer cells start to leave the main cancer and migrate. (metastasis) It involves injecting a radio active tracer around the tumour. This is swept away by the lymphatic fluid to a few sentinel nodes in exactly the same way as the cancer cells move to the same sentinel nodes. Currently, without SNB, all patients with mouth cancer undergo a complex 3-hour neck dissection operation, in order to protect the 30% of patients in whom the disease has spread. This means that 70% of patients have a major and unnecessary operation. Unfortunately the SNB test is till only available (June 2017) in one centre in London (UCLH). However NICE has advocated its introduction into clinical practice and Professor McGurk has set up a national training program at University College London for clinicians and surgical practitioners. The goal is to introduce SNB to all the cancer centres in the UK. This introduction of SNB will revolutionise the management of mouth cancer in the UK and will set the pace for Europe and America. Details of these training courses are on the events page. When cancer cells first start to spread from a malignant tumour in the mouth or face, the first place they settle is the lymph nodes of the neck. At present about half of the people diagnosed with an early malignant tumour (less than 4cm in diameter) will have normally appearing necks when they present to hospital. Yet we know from experience that 25% of them will have small undetectable deposits of a few cancer cells in their lymph nodes that carry a risk of developing into tumours. These are undetectable by current imaging techniques such as CT, MRI or PET scan. To safeguard this 25% of patients, current standard practice is for all patients to be given a neck dissection, even though 75% do not need this quite big operation. So by using a much smaller operation it is possible to separate the patients with tumour spread (and who therefore need further surgery) from the patients where the cancer has not started to spread. These patients therefore only need minimal surgery and are saved from an unnecessary neck dissection. Professor McGurk's test saves 75% of people with early malignant cancer from a neck dissection. Prof McGurk is also undertaking research to help locate the sentinel nodes more easily by using fluorescence as well as radiation. He is now able to add a fluorescent "rag" to the radioactive tracer so that the sentinel nodes can be found by a combination of gamma radiation and fluorescence. High Court ruling emphasises consultants' duty to fully inform the patient. The Surgical profession is conservative and slow to change. In many ways this is a good trait. More often than not it protects the patient, but it can also mean that there is a reluctance to accept worthwhile developments. Newer treatments are not always discussed or offered. It is important therefore that patients are aware of new developments that they can raise with their surgeon. This ruling emphasises that your surgeon should discuss the full range of available treatment options, even if the surgeon cannot provide them or does not agree with them. Informing the patient is the focus of the website. 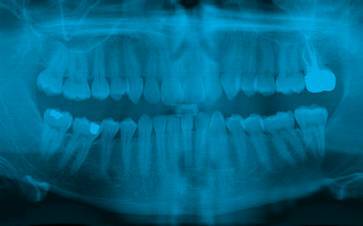 Professor McGurk has pioneered a new way to treat odontogenic tumours (ameloblastoma). 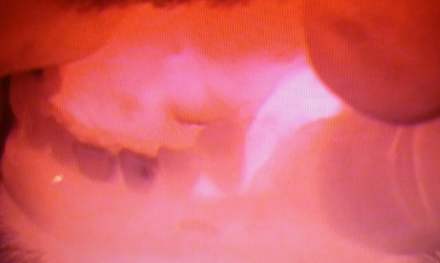 These are tumours of the jaw arising from teeth. Instead of resecting part of the jaw, these tumours can be removed by a minimally invasive technique which preserves the mandible and maintains normal facial appearance. Usually these tumours are treated by quite radical jaw resection. Evidence is emerging that this is not necessary. Professor McGurk holds symposiums on this particular topic and other areas of research. 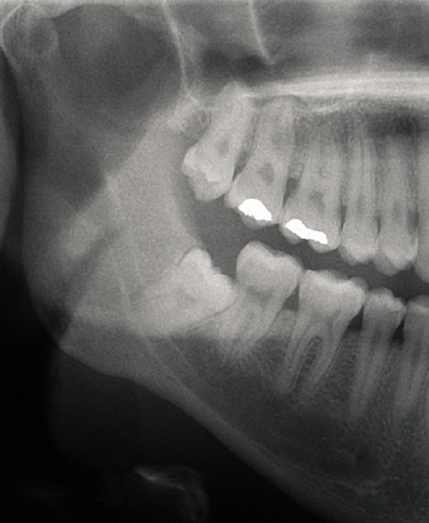 x-ray shows inferior dental nerve proximity to the wisdom tooth. In very few cases this nerve lies dangerously close to the root and can be damaged during extraction. We have developed a technique (Coronectomy) where the crown of the tooth is carefully removed and the root is left in position so the nerve is not threatened. The injury rate to the nerve in these "at risk" cases is reduced to less than 1% in comparison to complete extractions. There are very few complications. In 4% of cases the retained root starts to move after the operation and comes to the surface were it can be removed safely since it no longer threatens the nerve. 3D computer augmented reality allows tumour images to be projected onto the patient in real time.